Greeting cards express your deep concern, affection and your emotions towards your friends, family members or clients, it is an awe-inspiring business strategy to share and acknowledge a client’s individual key event or an occasion in the same way invitations are one of most important part for planning a wedding event. Mostly it is observed that the grace of a wedding is dependant up on the most honorable and valuable way to request your relatives of friends for your wedding. A wedding card is the first impression your guest will have about your wedding function. 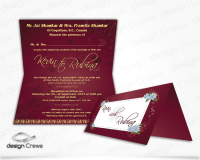 So its design, presentation and quality are the most important aspect while choosing a wedding card. We designs captivating and appealing greeting and wedding cards which suits you’re esteemed self and match your standards.